Who handles my affairs if I’m incapacitated? A complete estate plan should also include a Nevada Durable Power of Attorney, a Power of Attorney for Healthcare Decisions, and Medical Directive. In the event of incapacity, these important documents give direction and authority to others to make decisions for you. The older we get, the more likely we are to suffer from dementia, and in particular Alzheimer’s disease. According to the Alzheimer’s Association, if you have a brain, you are at risk of Alzheimer’s. At this time, it cannot be prevented, cured or its progression slowed, and over 5 million Americans suffer from the disease. If Alzheimer’s disease, or some other form of incapacity occurs, what happens? Who steps in to handle my affairs? If you haven’t designated who that person should be, it could be anyone. Often a family member will seek a guardianship. If no family member is available, the Clark County Public Guardian may be appointed. If that option is not appealing, you need to put in place the proper documents naming who you would like to make decisions for you. This document names who you would like to manage your financial and legal affairs. It sets parameters on the powers that the person has, and gives guidance about what you would like done. 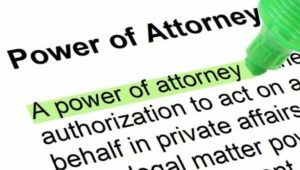 This power of attorney designates who you want to deal with the doctors, hospitals, and other healthcare providers on your behalf. You may also let the person that you’ve named know of any special requests or directions you desire. Also referred to as a Medical Directive or Physician’s Directive, this important document lets your loved ones and the doctors know what your desires are in the event you are on life support with no real likelihood of recovery. To make sure you have 24/7 access to your Living Will, please consider setting up a Nevada Living Will Lockbox. Wills and Trusts are not enough. Make sure that you also have a Financial Durable Power of Attorney, Power of Attorney for Healthcare Decisions, and Medical Directive that meet the Nevada statutory requirements. Depending upon your unique situation, there are also types of trusts that may be used in an estate plan, such as special needs trusts or gun trusts.